Inspired by Alice in wonderland and some new zippers I got from The world design room! Peacock Wonderland flower is 8.5cm across at the widest parts. The centre is made from a twirl of different peacock teal zips. The fine silver metal teeth give a jewel like sparkle. 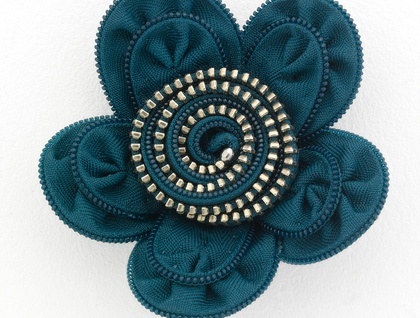 The outer petals are made from invisible zippers, everything is carefully hand stitched together. There is a brooch pin on the reverse side so you can pin them to your favourite outfits/hat /bag/coat. Just imagine it on your favourite coat or jacket!